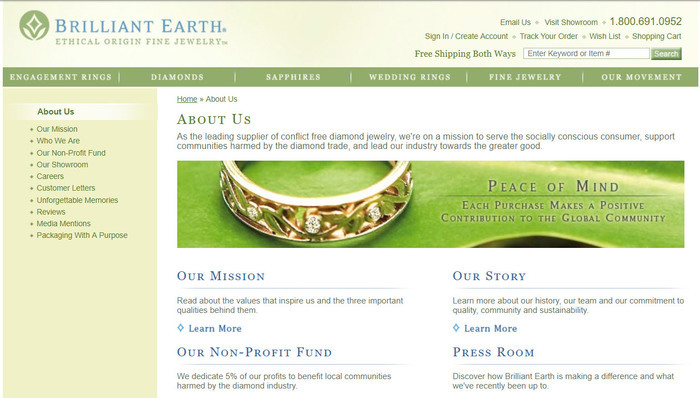 In 2005, the concept of a conflict free diamond was little known outside of the activist space. I was hired by Brilliant Earth to help introduce the concept of conflict free to a wider audience to support the launch of a new online retail business offering conflict free diamonds to the general consumer. I developed an approach that combined a public education approach to define the term “conflict free” and provide context on the complex environmental, labor, and political issues that led to its development. We developed the concept of “beyond conflict free”to communicate how Brilliant Earth went beyond the existing requirements for a gemstone to be labeled conflict free. I worked with Brilliant Earth for several years from before their website launch in 2005 to their rapid growth and success as the leading retailer in their space. During that time, I helped them launch a public education resource section on their website, implement SEO optimization, create a consumer guide to buying conflict free, develop a PR strategy, launch their first blog and email newsletter, and roll out a certification program for their dimaonds. Brilliant Earth become the leading retailer in their space in less than three years and was consistently the first retail result for conflict free diamond and related searches on Google during my tenure. Wikipedia’s definition of conflict free cited Brilliant Earth’s public education resources for several years. Thousands of consumers were able to buy ethically sourced gemstones with confidence because of Brilliant Earth’s in-depth informational resources.